FORT MYERS, Fla. — There are things to do and people to help, and sometime soon J.D. Drew will begin the rest of his life. But how soon? “My wife and I have talked about it a lot,’’ said the 13-year veteran outfielder, “and we had pretty much thought this would be it, but now we’re going to keep talking about things and see where this year takes us. Drew is 35 and in the final season of his five-year, $70 million deal with the Red Sox. He speaks passionately about his faith and his family and the life he wants to have with his children. He speaks of how he wants to carry out missionary work for his church when he gets through playing and how he wants to be able to help others less fortunate since he’s had such good fortune. You can debate the merits of the large contract he signed and whether Drew, who has driven in 64 runs twice and 68 runs twice in his four seasons in Boston, has lived up to it. He has been dubbed an underachiever by his critics, a guy with tremendous tools that maybe weren’t used to their fullest. At times his toughness has been challenged because he has spent some time on the disabled list and out of the lineup. 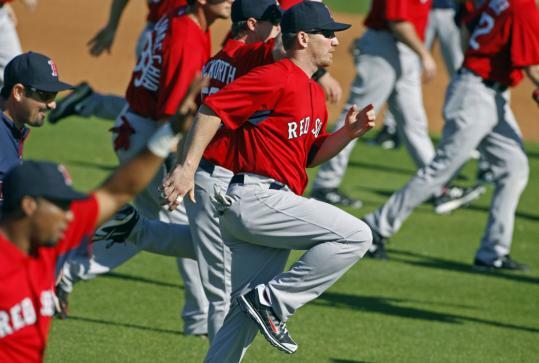 Even this offseason, he’s had to deal with a left hamstring issue that will need monitoring throughout spring training. But in four years with the Sox, he’s averaged 131 games a season, which isn’t too shabby, and last season he played in 139. Maybe he was the last player to arrive in camp and the last player to speak to the media, but does that really matter as long as he’s a contributor? In this lineup, Drew can hit sixth or seventh and disappear from the limelight. He doesn’t have to be the centerpiece, and he’ll still give you solid defense and grind out at-bats and wear down the pitcher. He’s a strong fundamental player who has been able to carry his teammates in stretches while also adding dramatic hits in the postseason. Drew, who broke into major league baseball at age 22, is long past trying to shape the opinions of his doubters and spends little time even thinking about it, except when the media bring up the subject of how he’s perceived as less caring and passionate about the game. Which, by the way, is not the reality. Drew does what he does, acts the way he acts. When he says he pays very little attention to baseball after he leaves the ballpark or in the offseason, he means it. He has another life. He’s a devout Christian and family man and he works hard at both. His offseason is spent at his Georgia home hitting off a batting machine — working out with his brother Stephen, a shortstop for the Diamondbacks — and trying to heal a body that has been battered by 13 years of major league baseball. When he stepped to the plate for BP on one of the minor league fields yesterday, he hit the longest home run of the day, a drive down the right-field line that most people would think had been hit by David Ortiz. There’s no question Drew can still play at a high level. He still has one of the sweetest swings in the game. There’s still a lot of grace and little strain in his every movement, yet he still may sit a lot against lefthanded pitching with Mike Cameron around as an extra outfielder. Drew hit only .208 against lefties last season, an abysmal number and the lowest of his career. In 2009 he hit .272 against them and over his career he’s a .255 hitter against lefties. Earlier in the day, he spoke to a group of media and said his goals were good health and trying to have quality at-bats. He’s always been a patient hitter with a high on-base percentage (.387 for his career) but he seemed to stray from that last season; his .341 mark was one of the lowest of his career, and he also had his lowest walk total (60) since 2006. While Drew is often accused of not having passion for the game, it appears the decision to let it all go is far more agonizing than any of us realizes. The last 13 years obviously have meant a lot to him.